When Erin McGoff, SOC '17, returned from an AU Alternative Break program in Laos, she knew she had to share what she had seen and experienced. 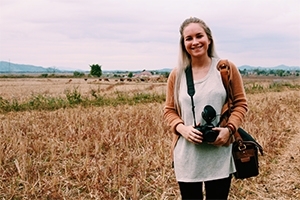 McGoff had an idea that would bring together her love of Laos and her talents as a film major. "I just said, 'I think I am going to make a documentary about this,'" McGoff said. The Alternative Breaks program, coordinated through the Center for Community Engagement and Service (CCES), gives AU students the chance to visit local and global communities to learn from community partners about social justice issues. During this spring break, many students are embarking on trips to Haiti, Honduras, Guyana, and New Orleans. Students who lead and participate in these programs often gain a greater appreciation and understanding of a community, and in many cases, it transforms their worldview. "Our emphasis on post-trip engagement and activism lays the foundation for students to continue their commitment to the social justice issue addressed," said CCES Director Marcy Campos. "That can take many different forms - policy or advocacy work, fundraising, panel discussions, cultural events, rethinking career choices, and more - but it's clear that the programs can be transformative." During the winter break of 2016-2017, McGoff participated in "Growth and Recovery in Post-Conflict Laos," which focused on Laos' economic struggles since the United States' covert bombing operation during the Vietnam War. McGoff decided to visit Laos based on her past trip to the country. "I first went to Laos in high school on a family trip across Southeast Asia," McGoff said. "I remember Laos being very beautiful, peaceful, and an ancient world that seemed hidden." When she saw that there was a trip to Laos being offered by CCES, McGoff leapt at the chance, even though she felt she did not fit the profile of a typical Alternative Break applicant. "I felt awkward applying because I am a film major and most of the students are SIS majors," McGoff said with a slight laugh. When McGoff learned more about the program, the idyllic vision she had of Laos changed. "I read the United States bombed Laos, per capita, more than any country in the history of warfare," McGoff said. During the Vietnam War, the U.S. waged a covert bombing operation against Laos between 1964-1973. According to the Lao Government's National Regulatory Authority, approximately 580,000 bombing missions took place during the nine-year campaign, with 270 million cluster bombs dropped on Laos. An estimated 80 million unexploded ordnances (UXOs) are still in Laos today, and they have killed an estimated 20,000 Laotian people since the end of the war. "It is a huge issue because Laos is a country of only 7 million people but 80 million UXOs are still there," McGoff said. "Many farmers walk into these fields or kids play in these fields and they trigger the bombs." The psychological terror of potentially setting off a UXO is terrible ordeal for Laotian people, but McGoff gained a new appreciation of the people. "What I learned from the trip is that Laos people are very resilient and forgiving," McGoff said. Shari Pattillo, Associate Director of International Student Development for Kogod, was the staff advisor for the trip. Pattillo noticed McGoff's lens during the program was different than the other students. "Erin saw Laos from a filmmaker's perspective. She made a lot of good contacts during the trip, which helped her for the documentary," Patillo said. Inspired by the trip and wanting to make the best use of her degree, McGoff set up an crowdfunding page to raise money and created a trailer for the documentary, which she called This Little Land of Mines . With the encouragement of her mentor in the School of Communication, Professor Bill Gentile, she applied for and received a Pulitzer Center grant. "Erin was quick to recognize the potential to tell a powerful story about the aftermath of conflict," Gentile said. "She then mustered the money, the team and the audacity to produce a film that will undoubtedly help enlighten many viewers in this country and beyond about the true human cost of war." When she had raised enough money, McGoff flew to Laos and collaborated with the production company MALAO Studios to help film. McGoff spent a month in Laos in September 2017 filming and capturing unheard stories. They followed Phetsamay Sichanthavong of Lao National Unexploded Ordnance Programme (UXO Lao) as she and the group worked to find and detonate the bombs. "We went to the Khammouane Province, which is one of the most affected areas but also one of the most underfunded areas," McGoff said. "We went to very remote villages and interviewed elderly people asking what it was like. One guy had lived in pitch-black cave for nine years and had endured over a million bombs. Another woman was a makeshift nurse for victims. There were bomb craters all over the country. I had goosebumps for a week," McGoff said. According to McGoff, UXO Lao work 252 days out of the year combing through farms, mountains, and rice paddy fields in search of UXOs. UXO Lao clears between 10-50 bombs a day and has been doing this for 22 years. Despite the long days, and many years of dangerous work, UXO Lao estimates that it has only cleared 1% of the UXOs in Laos. McGoff has ambitious plans for This Little Land of Mines and her film career. She hopes to get it on the festival circuit once it is completed and secure a distribution deal. "Currently, I am editing the film with my co-editor, Ka Xiong, who lives in Laos. It is exciting because we are editing internationally," McGoff said. "I want everyone in the U.S. to know about Laos and acknowledge the Laos people, who are cleaning up the United States' mess without much help from the U.S.," McGoff said. "I want to make the world a better place through film by telling stories of resilience and inspirational people overcoming the odds." McGoff said she hopes that one day this film can be shown at AU. "All of this was done because of AU. I would not have made this documentary or been informed of this topic without my time at AU."